Each bubble represents one of 169 countries. The information related to a country is summarized in a tooltip window when you hover the bubble. The area of the bubble is scale to the median estimates of the country-level social cost of carbon (CSCC). The color of the bubble follows a 3 dimension palette to span the CSCC values and the 66.7% confidence interval size (see Uncertainty below). The Global view shows the aggregation of the bubbles in two groups positive and negative CSCC. 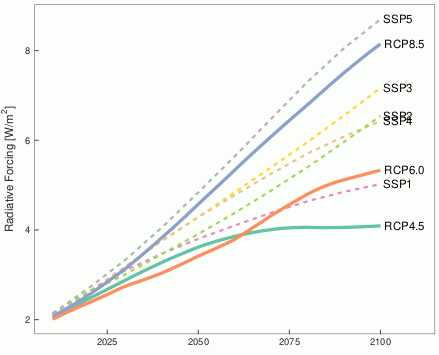 The Lorenz curve presents the cumulative CSCC against the the cumulative country population, to highlight the level of heterogeneity of the CSCC. The Map plots the bubbles according to their location in longitude and latitude. This work is based on "K. Ricke, L. Drouet, K. Caldeira and M. Tavoni, Country-level Social Cost of Carbon, Nature Climate Change". DOI: 10.1038/ s41558-018-0282-y. The database is available as supplementary material of the paper. Interactive Figures from the paper are available at http://country-level-scc.github.io/cscc-web-2018. The interactive explorer in this page has been designed and developed by L. Drouet. 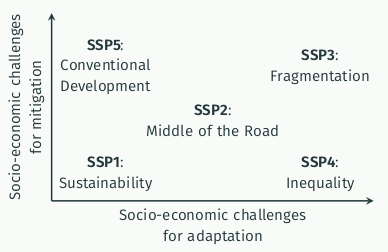 Country-level population and GDP projections are issued from the Shared Socioeconomic Pathways (SSP) database. Gridded climate projections are based on the Representative Concentration Pathways (RCP) and were generated by climate models participating to CMIP5. By default, the SSP are projected along with the closest RCP in terms of radiative forcing. The database contains four specifications of the damage function (see ref. Burke, Hsiang and Miguel, 2015 (BHM)). They are listed in the Table below. The Short-run specifications takes into account the temperature effects from the one year to the previous year, while Long-run it is over the 5 previous years. A variant Rich/Poor distinguishes the effect between rich and poor countries. By default, all countries are considered in one pool. Note that the specifications do not have the same statistical robustness and the is refected in the reported uncertainty range. The database contains the net present values of CSCC which are computed by discounting. Two types of discounting have used. While the fixed discount rate uses a unique value, the growth-adjusted discount rate accounts for the domestic growth rate and, thus differs across countries. In the interactive chart, the uncertainty value is equal to the size of the 66.7% confidence interval normalized to the median value of the global social cost of carbon (GSCC). This provides a measure of the accurary of the country-level social cost of carbon. This page project has received funding from the European Union’s Horizon 2020 research and innovation programme under grant agreement No 642147 (CD-LINKS).